I'm about to move to a place closer to my work where I'll be able to ride to and from the office (9km ride each way). I'm not super fit but I occasionally ride to work from where I'm living now which is a 14km commute on an old mountain bike with some thinner tyres fitted. I need a change of clothes for those rides. I figured with the move, it's a good opportunity to get into riding. I plan on riding every day and me and my gf may even sell one of our cars eventually. Which is why I'm thinking I need a real bike. I'm a little torn between getting a hybrid commuting bike or a road bike. My brain tells me a hybrid is much more practical but I tried a road bike the other day (only in a car park), and it just seems SO much lighter and smoother. In terms of the handle bars, it was awkward but I think I could get used to it. So yeah, if I pick a road bike where I can stick a rack on, should I just go ahead and buy a road bike instead of a hybrid? Is there anything a hybrid will offer me that a road bike will not? How do road bikes handle when they have racks? The real answer is that for a 9km ride, virtually any bike will do the trick. It's hard to be uncomfortable on a bike (that fits you) for that short of a ride. However, I'm fully in the road bike camp on this question. Hybrids are, in my opinion, a compromise with no real benefits. Most people aren't going to ride them off-road (and most road bikes can deal with short periods of offroad travel without problems). Cushioned saddles look great to novices, but divert weight away from your sit bones and are all but guaranteed to be uncomfortable should you decide to ride longer distances (for this reason, I can't recommend leather saddles highly enough, particularly Brooks'). The knobby tires that come standard on most hybrids have poor road handling characteristics, and actually result in less traction on the road in wet conditions (bicycles cannot hydroplane). On the contrary, a properly setup road commuter will offer you more hand positions via the drop handlebars (on the flats, the hoods, and drops) compared to just one. This will be invaluable for longer rides where your hands fatigue from maintaining one position. They can come with wider non-racing tires (I commute on 28C Panaracer Ribmo tires, and haven't had a flat in over 10,000km). And appropriate commuting frames come with rack and pannier bosses, and many will have racks preinstalled. So while a hybrid bike will work, an appropriately-equipped road bike would be better in that it will be able to adapt to your needs should find yourself wanting to ride longer distances or join faster group rides. The two main advantages of a hybrid are 1) that they are more comfortable, and 2) that the larger tires will leave you less prone to getting flat tires. The "comfort" thing depends on a number of factors--remember, no one logs more time on their bikes than dedicated road cyclists, and so road bikes are made for comfort--just with a steeper learning curve. If you have back problems, you may find the more upright position of the hybrid to be beneficial. If you are riding in a location with a freeze-thaw cycle, the roads may be unpleasantly bumpy on the skinny tires of a road bike. One other option is to consider a cyclocross bike. Cyclocross bikes are essentially hybrids, except they stay much close to true road bikes. You will have drop bars, and road components, but the bikes will also be sturdier, and accept wider tires. 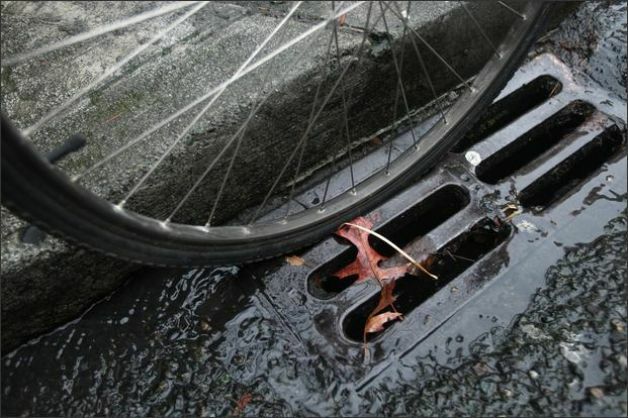 are more prone to punctures from hitting items or bumps. transmit more road bumps and vibration to the rider. Narrow tires are not as comfortable for 10km. Fatter tires act as shock and vibration absorbers for yourself and your cargo (laptop? ), allowing you to be less picky about choosing a smooth line. It also means you are less confident or safe when "forced" into a line or terrain that is not ideal, such as when heavy traffic does not allow you to swerve around a bad patch of road. And more, looser weight (clothing, cargo) means you aren't as nimble as a racer, which makes it even more difficult to avoid bad terrain as a commuter. For performance-oriented road bikes, there are fewer attachment holes for racks, fenders/mudguards, etc. Also there is less clearance for mudguards and/or more comfortable tire sizes. Hunched / horizontal torso posture on road bikes makes it more difficult to look around or behind as easily as more upright riding postures. This affects safety in high traffic areas. Due to the hunched-down posture on road bikes, shoulder bag / "messenger bags" swing down to your front, which then become an unstable pendulum that swings around as you ride. Even when a bag is around your back, there is a constant distraction of feeling like it is about to swing or of needing to elbow it back (which may mean removing a hand from the handlebars). It's certainly possible to commute with a road bike. And you can work around or master the above issues with extra time in practice, additional hardware, new techniques. And note that almost any bike is going to get you 10km pretty easily. For these reasons above, I suggest following the other responders' suggestions on avoiding performance- or race- oriented road bikes. "Urban" / "City" / "Commuter", or even "Dutch" bikes. These categories of bikes have broadened and improved in recent years due to the growth of the number of people such as yourself looking to commute but not race. They tend to be more upright than road bikes, and either have or can accommodate fenders and racks. E.g. "Fitness" or "Flat handlebar" road/hybrid bike. E.g. "Mountain" bike (without suspension), fitted with "slick" or "street" or "commuter" tires. A very common commuter solution. Google Image search for any of the above terms along with "commuter bike" and you'll get a gist of what seems to work well for people. E.g. "mountain bike commuter". The main downside to the road bike is mounting options for fenders, rack, and panniers, etc. Basically, most road bikes available simply don't have the braze-on's for fenders, racks, etc. So, you'll have to shop around for a road bike with braze-on options. The other option for hauling stuff is to use a backpack or messenger bag. This is not a deal breaker for some people and some commutes. In terms of hybrids... There are many options for hybrid bikes these days. As far as I know, all of them have a general set of braze-ons that allow for fenders, racks, panniers. All of the major manufacturers have multiple "hybrid" options. 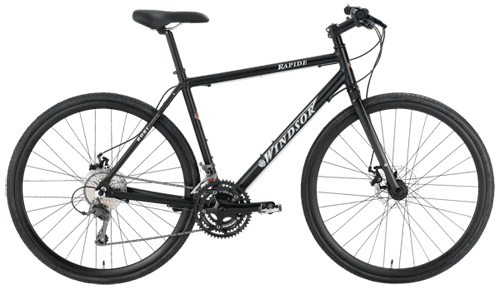 Some of these hybrids are pretty sweet bikes with mainly road bike features. They're often marketed as "fitness" hybrids. An example that a friend just bought, is the "District 9" by Trek; he did swap out the upright bars for drop bars though. Point is, several manufacturers (Scott, Cannondale, Specialized, etc.) make this type of hybrid, so this could be a good option. Your third option could be a touring bike. All in all, figure out your major use and how much stuff you're going to be hauling around. Then start shopping around and try out a few bikes. I recently helped a friend shop for a new bike for his commute. He is mostly a road cyclist, but finally selected a "fitness" or "road inspired" hybrid for commuting purposes and lunch time workouts. The bike is essentially a road bike, but with braze-ons for fenders and rack/panniers. It's also somewhat heavier than a regular road bike, came stocked with 700x28c tires, nice rims, had flat bars, racing type seat and otherwise had quality components. He made a deal with the bike shop to swap out to drop bars and shifters/brake levers for the drop bars. This is a nice bike which is a lot of fun to ride; and seriously I could easily spend 4 - 6 hours on this bike, but I wouldn't want to do a very hilly century on it. Get a road bike if you really want one and aren't terribly concerned about hauling loads. Otherwise, newer "fitness/road inspired" hybrids may be a good option for your purposes. I love riding to work on a full on road bike, but plan it so I leave my laptop, spare clothes etc in the office the day before so I don't have to try and lug everything in. A hybrid is going to have a larger gear inch range than a road bike, typically - translation: You'll have a few more lower gears for those hills. It's going to have a more relaxed frame angle - translation: It'll feel like a softer ride but with less nimbleness in the reaction of the steering which you may or may not like. With the more relaxed geometry, that allowes room for racks, bigger fenders(mud guards) and larger tires if you feel the skinny tires are not your thing. It stretches things out when you have a relaxed geometry. The frame will have more braze-ons too for those expected add-ons. Hybrids also typically come spec'd with a straight handle bar like a MTB but that can be easily changed out for a traditional drop bar which gives you loads more positions to hang onto plus you can get dual brake levers - hooded brakes for the drops with two-finger brakes in serial on the uppers. Mind you with a road bike you can change the drops to an upright straight bar too. Usually people change to a straight bar because they feel they won't be able to grab the brake levers fast enough if they have drops. However after you get the hang of things you start to ride with your hands on the hoods and have a couple of fingers resting on the levers ready to feather the brakes when you need them. With a road bike you have a very small point of contact with the road (skinny tires high preasure) which is why it feels (and is) more responsive. You could get road bike tires for a hybrid and get the same feel. Lastly, hybrids are designed more for rec riders so they make them a little bit more beefy than a road bike, which are trying hard to be as light as possible. Chances are at a given price point you'll see the road bike win the weight battle. Mind you it might only be by a pound so once you factor in the gear you'll be carrying with you you won't really care about that too much. As seen from earlier answers, there is a great deal of variability in the design of both road and hybrid bikes, such that the definitions overlap quite a lot. Perhaps the most common difference is that "road" bikes typically have drop handlebars and "hybrid" bikes typically have flat bars. So maybe the question boils down to which bar style is better for commuting. On the downside the wider bar is occasionally awkward to fit through gaps in queueing traffic. Better aerodynamics due to narrower hand placement and especially when in the drops. Multiple hand positions for improved comfort. These are less important on a relatively short and slow urban commute. I have both a drop-bar bike and a flat-bar bike. Although the drop-bar bike is faster and more comfortable than the flat bar hybrid and overall does more distance in a year, I prefer the hybrid for commuting across town. A large part of the reason I choose the hybrid for commuting is the bar style. I pondered over this question for quite some time before my decision fell firmly on the hybrid.this was mainly due to my commute taking me through the peak district over roads which are pitted, poorly maintained and riddled with unavoidable potholes which a hybrid can effortlessly cope with but would prove expensively lethal to a road bike's thin tyres and wheels. I could opt for a more road bike friendly route put it would add 4 miles to my journey which defeats the object of additional speed. It all depends on your personal needs. A room for a fixed front basket especially larger ones. Increased room for accessories such as bells, horns, switches, buttons, reflectors, tablet holders, phone holders, bike computers, spare lights, etc. Better view when using handlebar mirrors since the handlebar is often wider, allowing the mirror to be placed further away. More options for mirrors and bells. More options for brake levers and shifters. Lower cost of the bicycle. Higher braking power as you get more leverage on a hybrid bike's brake lever than a road bike's brake lever on the hoods. Improved visibility and the ability to see further ahead as you're taller. The ability to produce higher power when the speed limits are lower which may be appreciated by fitter cyclists. This would increase the opportunities for doing interval training. A road bike will have less comfortable ride position which is more suitable for long and fast ride than for a mere commuting. A road bike is much more complicated and expensive machine. Some parts are harder to replace and are more expensive on a road bike. Brake levers for example - the price and complexity differs greatly. Hybrid bike tends to have somewhat smoother albeit less dynamic ride. I own a steel frame giant hybrid. It is really smooth, hugs the road, and is very comfortable. I have modified it with a Humpert QAS Adjustable Quill Stem 1 1/8 - Quick release angle adjustment. This allows me to modify my handlebars either down low or almost in the upright sitting position. Great investment if you want comfort. I have pedal extenders and run schwalbe 700 x 35C marathon plus and have never had a flat. I'm over 65 and my wife and I ride about 60 - 80 miles a week. We love our hybrids and wouldn't change them for anything. At my age a road bike would break my back. The wider tires work great too!. Not the answer you're looking for? Browse other questions tagged road-bike commuting-bike or ask your own question. Road bike or hybrid bike? Tips for improving commute efficiency/comfort? Ultra road machine or a CX/gravel bike to replace/augment my MTB?